Karate Basics are the Secret of the Best Martial Arts! Karate Basics are the secret. Anybody who has gone anywhere in the martial arts knows that the foundation for all future movement must lay in proper basics. But Martial Arts Basics is the right answer. Anybody who has gone anywhere in the Martial Arts knows that the foundation for all future movement must lay in proper basics. Korean Karate Basics, Goju Ryu Basics, all martial arts basics rely on certain dynamic moves that define the art. But, and here I am about to say something that might not be popular, there is something wrong with the fundamental moves in Karate. To be more specific, there are quite a few things wrong with the Basic Kata in Karate. Before the rope appears in the crowd let me make a couple of points. When is the last time a mugger stepped forward with the same side hand and foot to mug you? When was the last time you used such a movement in Freestyle? And if somebody was going to attack you from the side would you turn 270 degrees and then step into them? If you did a downward Block, presumably to protect oneself from a kick, would you then take a full step forward to punch? If you consider these questions in light of the beginning Forms, and even quite a few that are not so beginning, you may understand what I am getting at when I say the beginner Forms, as practiced in most Karate systems, are unreal and even ridiculous. To be honest, I have heard all the justifications for them. I have heard the simple, ‘Just to practice breathing,’ to the complex, ‘When one turns 270 degrees to the rear they are in float time which will give them the idea that they must ‘Let go’ of gravity to properly pursue Martial Technique. Of course if somebody was to accept all that I am saying, without reservation, that would leave them out on a limb. For if we don’t have the beginning Forms to learn a proper foundation would do we have? House is a Karate kata which, if taught correctly, can replace all existing initial Karate Forms, and can even be adapted to Kung Fu Basics, and other martial arts. It is short and simple, only seven steps, and yet the practitioneer who studies the House Kata will progress much faster and further, in a much shorter period of time, than practitioneers who stay with the current beginning Forms.Let me explain it step by step. From a Natural Stance step back with the right leg into a back stance. execute a left Low Block. If you circle the left hand in front of the face you can protect the face with a Palm Bock. Circling will be much faster than the normal ‘Back and forth’ motion currently used to execute a Low Block. Practice dropping weight down the rear leg, which helps the student ‘Ground’ his Energies,and which ‘coils’ the rear leg for a proper push. Applications can include a punch to the face, a kick or a low punch. Step forward with the left leg into a Front Stance as you execute a right Reverse Punch. If you were going to push a car would you push with your hands? Or would you push with the legs? This is the concept to be explored here. I call it ‘Punching with the big muscle.’ If somebodypunches in this fashion the whole body will be thrust into the punch, so your punch can weigh, even without velocity, a couple of hundred pounds, instead of the simple 20 or so pounds of an arm. Step forward with the right leg into a Back Stance as you execute a right Outward Middle Block. Make sure the left hand provides a Cross Palm Block to guard the face, If you circle the punching hand properly you will find notonly a Middle Block, but an inverted Downward Block and an escape from a grab to the wrist. Make sure you don’t collapse the arm, but rather keep the elbow at least 90 degrees, and angle it from the Tan Tien. Step forward with the right leg into a Front Stance as you execute a left Reverse Punch. This particular technique, stepping forward with the front leg, is almost never used in the Martial Arts, yet it sets up ‘Shuffling,’which is probably the most used technique in Freestyle. provides a Cross Palm Block to guard the face. Make sure the Blocking hand rises on the Centerline before turning the elbow out. Within this move one will guard the face with both the Cross Palm and the High Block, guard low with the inverted Low Block, find an uppercutand the beginnings of an armbar (should someone grab your wrist or punch in a certain manner. execute a right Reverse Punch. One should practice moving the hand and the foot together to increase ‘Coordinated Body Motion.’ Also, a good Instructor will continuously challenge the students techniques by pushing (Body Testing) so that the Energy must betranferred through the body and into the ground. Step back with the left leg into an Hourglass Stance (facing 90 degrees from the direction of the form) as you execute a simultaneous left High Cross Palm Block and a right Low Cross Palm Block. 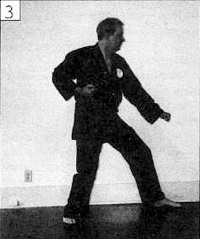 The student becomes immoveable by learning how to ‘Stand like a Mountain.’ Within this technique there are different level Palm Blocks and elbow strikes, as well as the potential crossed arm blocks. 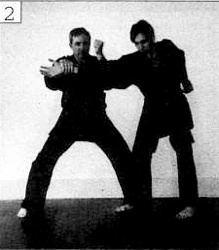 These Karate Basics, arranged properly, form a circle around the front of the practitioner’s body wherein each block covers approximately 6 inches of space (a hand length), which defines exactly where and how each block should be done. While this doesn’t obviate the necessity to learn how to make Karate Basics work in a variety of different manners, this datum does simplify and give an order and logic to the Basics which is unassailable. basics in light of this theory, one is able to combine the basics in a much more comprehensive and effective fashion. I have to tell you that I happened on this theory while trying to figure out Pa Kua. After a number of years of trying to figure out basics and twining them together I turned around and applied the same principle to Karate. The results were more than I imagined. could actually create virtually every single technique in Karate, and virtually all the martial arts. Consider the following technique and variation. hand. The Defender catches the punch with a High Crossed Wrist Block. 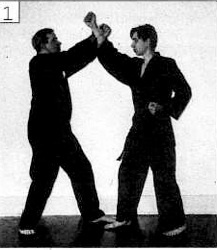 The Defender pulls the Attacker’s wrist with his right hand while executing a left downward Backfist. The downward Backfist is a different way of entering the arm position described by a Middle Block. This sets up a Reverse Punch. Or, the Defender could pull the Attacker’s arm into an Armbar, which, again, is a different way of entering a Middle Block. The Defender lowers his hands through the Low Block positions to take the Armbar into a Takedown. This has been a page devoted to, and a whole form devoted to, Karate basics…go to Matrix Karate on this site if you wish to get more information about this subject. 7 Responses to Karate Basics are the Secret of the Best Martial Arts!